Last month, the ‘Reducing disease risks and improving food safety in smallholders pig value chains in Vietnam’ or PigRisk project team and partners held a bi-annual planning meeting in Hanoi, Vietnam. 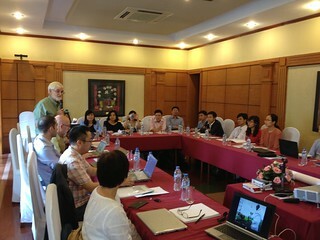 The two-day workshop (26-27 April 2015), which was hosted by the International Livestock Research Institute (ILRI) in Vietnam, discussed accomplishments of the project since the last team meeting in December 2014 and set project goals for the next two years. PigRisk is a five-year project that is seeking to improve the livelihoods of smallholder farmers in Vietnam by enabling them to better participate in pig value chains to improve their incomes, with project activities focused on addressing the human and economic costs of pork-borne diseases and food safety risks associated with pork consumption. It is funded by the Australian Centre for International Agricultural Research (ACIAR). Participants in the meeting included researchers from the International Livestock Research Institute (ILRI) and Vietnamese partners in the project including the Vietnam National University of Agriculture, the Hanoi School of Public Health, the National Institute for Animal Science, the National Institute for Veterinary Research and the National Center for Veterinary Hygiene Inspection. The ACIAR’s country representative and support staff also attended the meeting. 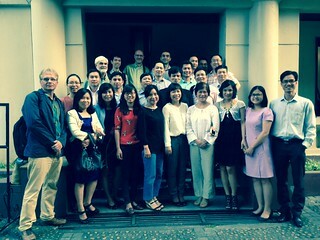 The PigRisk planning workshop was held on 26-27 April 2015 at Army Hotel in Hanoi, Vietnam (photo credit: ILRI). As part of planning for 2015, the workshop participants devoted a session for outlining the outputs, timelines and responsibilities for the year. The project team also drafted a project publications plan by preparing a list of planned journal and conference publications. Three abstracts were prepared for submission to various conferences by the end of the meeting. View/download the PigRisk project fact sheet. Visit PigRisk’s wikispace for more information on the project. See a related post about PigRisk’s inception workshop in 2012. 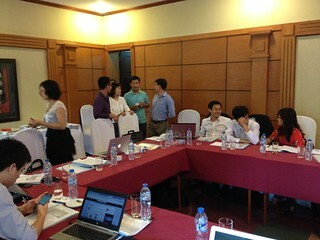 Tags: ACIAR, East and Southeast Asia, Food Safety, ILRI, Pig Risk, value chains, vietnam, workshop. Bookmark the permalink.